Having adequate tire pressure is a way to maximize fuel efficiency, but exactly how much can this save you when fueling your car up? Well, according to the United States Department of Energy, having properly inflated tires can make a big difference. The United States Department of Energy reports that for every psi (pound per square inch) that your tires are under inflated, there is a 3% drop in gas mileage. That is the equivalent of spending an extra $0.10 per gallon at the pump. So, instead of paying $2.99 per gallon, you pay $3.09. If you have a small car with a 12-gallon tank, that adds up to $1.20 extra per time you fill up. If you fill up once a week, that adds up to $62.40 a year. Maybe that doesn’t seem like a lot, but then again, that’s dinner out for a family of four or a week’s worth of groceries. Over the course of the time you have your vehicle, those savings add up! The proper psi for each tire is usually anywhere from 30-35 psi, depending on the make and model of your vehicle. You can find the proper psi for your car and tires in the owner’s manual or on a stamped plate or sticker inside the door frame (usually the driver’s side door). You can measure and maintain your tire pressure by checking it once a month. You can do this with a small psi gauge that you can pick up at any auto parts store. This reading can be taken at any time, but it’s most accurate when your tires are cold. Tire pressure changes one pound of pressure for every 10 degree change. You can adjust psi to the proper levels by letting out air when your tires are hot and adding air when they are cold. 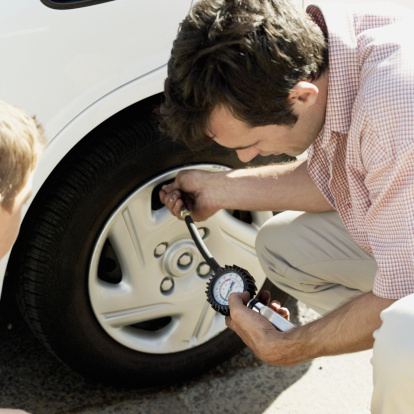 Tire pressure isn’t only important for good gas mileage, it’s important for safety. An improperly inflated tire can cause a flat tire when under inflated or a blow out when over inflated. Both these situations have the potential to cause accidents. At MVD Express, we care about the safety of our roads. You can help us keep New Mexico roads safer by keeping your tires properly inflated!